"Lift high the cross, the love of Christ proclaim / Till all the world adore his sacred name." This popular hymn beautifully expresses our sentiments as we celebrate today the feast of the Exaltation of the Cross, also known as the Triumph of the Cross or simply the feast of the Holy Cross. We celebrate this important feast for two reasons: (1) to recall an historic event that proved to be extremely important in the life of the Christian church, and (2) to underline the importance of the symbol and reality of the cross in the daily life of every Christian man or woman. The important event we commemorate is the finding in the year 326 of the relics of the cross on which Jesus was crucified. According to St John Chrysostom, St Helen, mother of Emperor Constantine, longed to find the cross of Christ. For this reason she travelled to Jerusalem where she organized a dig at the hill of Calvary. The diggers uncovered three wooden crosses. They could not tell which was the cross of Jesus and which were the crosses of the two thieves crucified with him. Finally they brought a sick woman and a dead man who was being carried to burial. The three crosses were placed one after the other on the sick woman and on the dead man. Two of the crosses had no effect, but on contact with the third cross, the sick woman was healed of her infirmity and the dead man came to life. These miracles clearly indicated which of the three was the holy cross. News of the finding of the true cross quickly spread and believers gathered to see the true cross and to venerate it. The Patriarch of Jerusalem, Makarios, standing on a raised platform, lifted high the cross, "exalting" it, for all to see. The people fell to their knees, bowing down before the cross and crying out repeatedly: "Lord, have mercy!" St Helen then commissioned a church to be built over the site. The church of the Holy Sepulchre was consecrated on September 13, 335. The feast of the finding and exaltation of the Cross was appointed to be celebrated annually on the following day. The basilica of the Holy Sepulchre is today regarded as the holiest spot on earth by Christians of all denominations. Today the sign of the cross has become a universal Christian symbol. When people sneeze and cross themselves or athletes make a sign of the cross before or during play, we recognize them immediately as Christians. 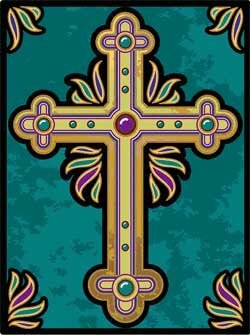 Ornamental crosses are fashionable today in the form of necklaces, broaches, earings, and the like. A crucifix (the cross with an image of Christ's body upon it) identifies a church as a Christian church. Likewise, crucifixes in the homes, the school and the classroom is a constant witness and reminder of our faith in Christ who died on the cross to set us free. These are all useful and important ways of proclaiming and lifting high the cross of Christ. The cross is not just a piece of wood. It is a symbolic summary of the suffering, death and resurrection of Christ by which we have been redeemed. It is a symbol of our faith in the crucified and risen one, our Lord Jesus Christ. Jesus taught us that the cross should be a constant feature in the daily lives of his followers: "If any want to become my followers, let them deny themselves and take up their cross daily and follow me" (Luke 9:23). To take up the cross in this way we need to do more than wear a crucifix or place it in our surroundings. To lift up the cross the way Jesus asks us to do is a way of life. It is to accept self-denial and sacrifice as part of our daily lives. Sacrifice means to give up something that is of value to me for the sake of God and the benefit of my neighbour. Another word for it is love. Love is measured by sacrifice. People who love much sacrifice much. Yet sacrifice does not make us poorer but richer. This is what we see in Christ. This is what we see in the lives of the saints. This is what we are all called to be. Let us all today resolve to "Lift high the cross, the love of Christ proclaim / Till all the world adore his sacred name."